Aspen management is often achieved through even-aged management (also known as clearcutting). Aspen is an early successional, shade intolerant tree that needs large disturbances and plenty of sunlight to regenerate. It is not a species that can be effectivity perpetuated by thinning. 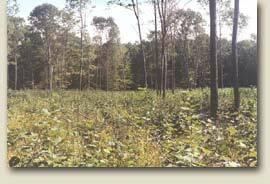 Aspen clearcuts are also an important source of early successional habitat prized by many forest-dwelling wildlife including deer, grouse, rabbit, and turkey. Hardwood management is generally done through a series of thinnings to increase growth on the residual, better quality trees - with an eye on a future and high value timber harvests. 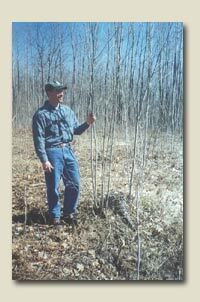 Stand density and stocking are important factors to consider when marking a northern hardwood stand for harvesting. Red pine management can include thinning existing red pine plantations, performing a final harvest, or planting red pine seedlings for eventual harvest. Red pine is typically planted in plantations and managed for quick growth and high financial returns. Cost sharing for tree planting and other forestland improvement projects may be available through the 2002 Tree Farm bill. Other types of management. There are many other types of forest management activities including seed tree cuts, shelterwood cuts, and prescribed fires that may be used in different situations.